Excellent portrait capture in B&W with great clarity and contrast! Aside from the fact that it`s a fabulously conceived portrait, the most compelling aspect for me is that there is promise of a story behind the image that pulls me in and makes me guess. Awesome creativity, voted in The Eyes Have It !! What a lovely composition! Simply superb! AWESOME portrait, great light, voted in A Child Expression ! Beautiful! A personal favorite! Admired in A Favourite Black and White Photo Challenge. I took this shot indoors in a small room which I occasionally use for photography if the weather outdoors isn't favourable, e.g. wet and windy. I shoot mainly on-location but also enjoy working indoors from time-to-time. I used 2 soft boxes set at 45 degrees each side of the child to give a nice catch-light effect in each eye. Nikon D700 camera and Sigma 85mm lens set at f/1.6, 1/250 sec and ISO 200. It was the first time I had used this particular lens in an actual photo session although I had practiced with it beforehand using a mannequin dummy! The lens has since become a firm favourite. I had purchased the cat mask a couple of weeks earlier and thought it would look good framing the little girl's beautiful soulful eyes. 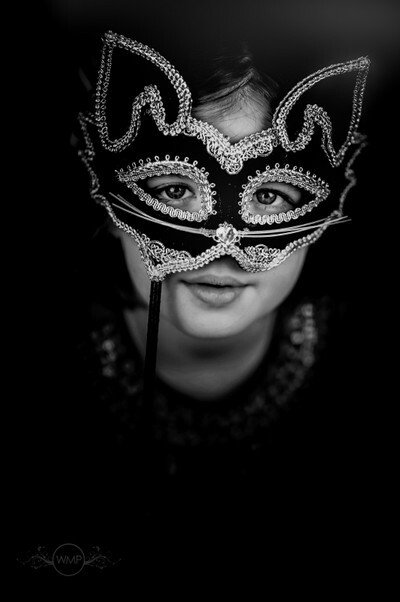 I remembered the mask towards the end of the session and gave it to the little girl to play with. She was nice and relaxed and I just asked her to place it up to her face and quickly snapped the photo as she did! It suited her perfectly and she loved it so much, I ended up gifting it to her. The photograph was originally shot in colour against a black background. I converted the photo to black and white using Lightroom 5 as I thought it would work well with the silver and black mask. I brightened the child's eye whites slightly and added a little clarity and sharpening over the eyes to make them pop. I had to be careful not to over-whiten or sharpen the eye whites as it would have looked fake, so I kept this to a minimum. I also boosted the contrast a little. I didn't have a hair light (which I'd normally recommend for portraiture), but in this case, it worked better without because I blended the hair into the background drawing attention straight to the front of the photo and directly towards the child's eyes which are framed nicely within the mask. Nikon D700, Sigma 85mm f1.8, Sigma 24-70mm f2.8, spare camera and speedlight batteries, spare memory card, Nikon SB900 speedlight, lens cleaning cloth, and an inexpensive JJC WB-F1 White Balance Filter which can be used with most lens sizes. I also carry a couple of clear bin liners which are really useful to place under your subject to keep their clothes clean if they're going to be sitting on the ground. They can be tucked away neatly underneath the subject and don't show up in photos. A good way to help someone relax during their photo session is to ask them to hold something in their hand, e.g. a prop (in this case the cat mask). It may therefore be something you can interpret into the photo as in this particular instance. Other examples include a mobile phone, key ring, etc. Such can work like a kind of pacifier and helps the subject to relax. Also, if the 'pacifier' is small and not a part of the overall scene, e.g. a keyring, it won't show up in the photo which is ideal. I've tried this method a few times now and on each occasion, it has worked! Also, sometimes it's not easy to find a model at a moment's notice if you need to practice which is frustrating. I took this photo when I was fairly new to photography and in order to practice, I used a mannequin dummies head and practiced using this leading up to the shoot! I still use the mannequin 'substitute' to practice under various lighting and weather conditions, e.g. indoor lighting, outdoor lighting, back lighting, etc. It's also particularly useful for checking depth of field.